During the pre Christmas madness I hastily saved a number of recipes from blogs I follow. Each had something that tempted me and with this recipe it was walnuts. It’s no secret that I love walnuts. The originator of this delicious sweet treat is a blogger friend of long standing, Debi from “My Kitchen Witch.” Debi transplanted her life from the north of England to Athens for a little over 12 months ago and the influence of her new Greek kitchen is discernible in the recipes she posts. I think the filling for these pastries would be equally at home wrapped in crispy filo, but I felt it best to honour Debi’s intentions so I made a tummy friendly sweet spelt and walnut meal shortcrust in lieu of the pasta frolla she recommended. I began the day after the recipe was published but I was not destined to see it through so the pastry ended up in the freezer. Out of sight really does mean out of mind, I totally forgot about it until it turned up under a loaf of bread, then it haunted me until I finally found the time to finish what I’d begun a month previously. Debi’s Walnuts Bites were a big hit. We loved the hint of spice, we loved the subtle sweetness, but really it was the walnuts that had us addictively popping these pastries into our mouths. Despite having to substitute the honey originally used to sweeten the nut filling, I loved the flavour so much I could have eaten it with a spoon. Debi, thanks for your inspiration, this idea and the recipe, it’s a beauty…. Rub the butter into the flour until it resembles fresh breadcrumbs. Add the egg and mix until just incorporated. Bring the pastry together with a scraper and form into a ball. Chill for at least 30 minutes. Preheat the oven to 180C and line two oven trays with baking paper. Divide the pastry equally into four then remove only one piece from the refrigerator at a time. Generously dust the bench with spelt flour, then roll a portion of the pastry into an oblong about 16cm square. Use a spatula or pastry scraper and nudge the edges into shape. Cut the pastry in half then spoon nut filling into a roll about 2cm in diameter along one edge of each piece. Using a pastry scraper as an aid, roll each piece over so the pastry encloses the nut filling. The buttery pastry will self seal. Cut each roll into slices about 3cm wide. Transfer to the paper lined oven tray. The pieces can be reasonably close together as they won’t spread in the oven. Continue rolling, filling, folding, and cutting until all the pastry and nut filling are used. Transfer to a wire tray to cool then dust with icing sugar. These delicious pastries freeze beautifully once cooked. Once thawed, no one would ever know. Fantastic Sandra! Thanks for the shout out. You had me in suspense on what you substituted for the honey – had to keep myself from scrolling right to the list of ingredients. Maple syrup sounds marvellous. Anything with a sweet sticky texture works. Really glad you liked them! They sound deeelicious. And Happy Birthday for tomorrow lovely lady! Aw, thanks Alina, catch up soon..
Oh yum! When I first read that you make the pastry, I thought “Forget it”. But then I read the procedure and it seems so easy. Definitely a recipe to keep. Thanks Anne. I used to be intimidated by pastry too but machinery makes a difference. They sound delicious. Am not baking anything at the moment, such is the heat and humidity here… but eventually it will end. Thanks Sandra. 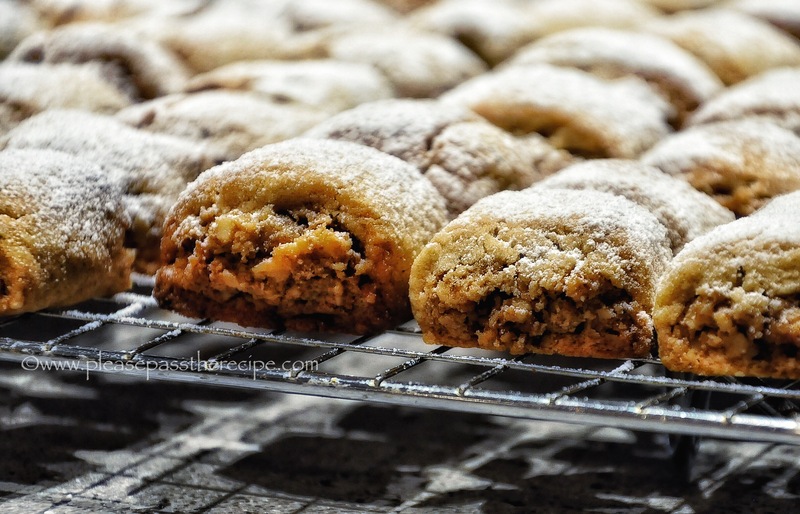 This entry was posted on January 12, 2017 by ladyredspecs in Baking, Cookies, sweet biscuits, FODMAP diet, Food, recipes and tagged cookies, Fodmap, sweet biscuits, sweet pastries, walnuts.